We're less than 24 hours from Sony's CES 2018 press conference and the Japanese giant wants to make sure that consumers are getting news about its products as fast as possible. 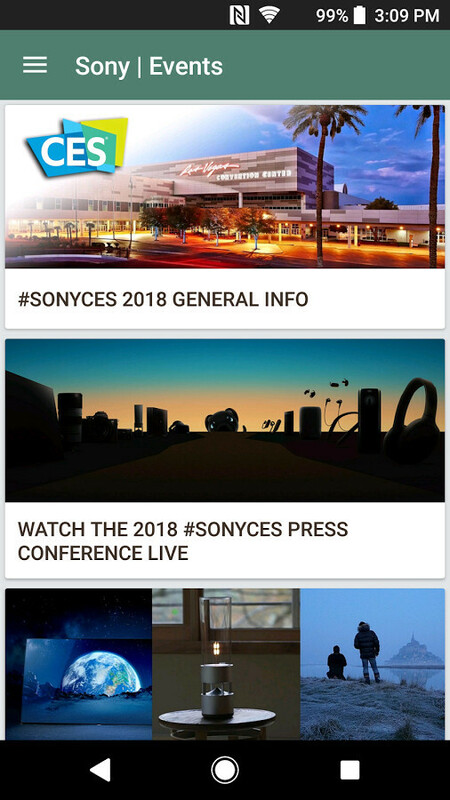 A new mobile app is now available for download in the Google Play Store that brings you the latest information from Sony's presence at different events throughout the year. Aside from news from CES, Sony promises to give access to the latest news about its latest products announcements as they happen at SXSW and IFA. There's no mention of Mobile World Congress (MWC), but that's likely to be a mistake since Sony Mobile's most consistent presence takes place in Barcelona each year. Also, Sony Events app promises access to exclusive behind the scenes 360 degree video, which should provide virtual tours of the company's booth for those who can't attend these major tech events. And for those who are at CES or MWC, Sony Events offers a booth map of the company where they can find the latest products announced, once the shows begin. Make sure to download the app if you want to receive the latest product announcements as quickly as possible. Will there be a Sony bezeless phone this year! ?